The Synergy amplifier is based primarily on a "mass-loading" principle, where a heavy cooking pan chassis is used to minimize vibration and resonance. 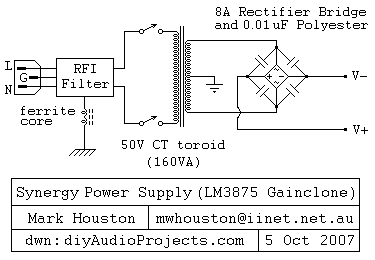 The amplifier circuit is a minimalist three resistor LM3875 gainclone (chip amp). I had read an interview with 47 Laboratory where they comment on how they deal with resonance and vibration by making the amplifier "rigid and compact". I have made efforts with past DIY amplifier projects to reduce resonance and vibration, but for this project, "rigid and compact" is the whole principal on which the Synergy amp is designed. 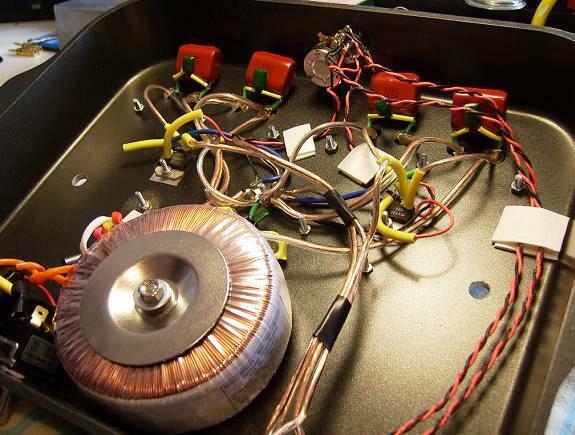 Gio had built a small Single Ended 50EH5 tube amp using an aluminum baking pan and I have also seen other amps housed in these inexpensive enclosures. Extending this idea for an inexpensive chassis, I purchased the heaviest cast aluminum (3 mm thick), baking pan I could get my hands on. Add to it a massive chopping board made from laminated pieces of heavy timber with handles, and now we are cooking! The finished amp weighs 26 lbs so the handles are necessary. A big heat sink is bolted to the top of the chassis to assist with cooling but mainly to add extra mass to where the chips are mounted. Low profile brass feet are attached to the cutting board and 1/4" diameter bolts, spring washes and wing nuts torque the chassis to the base. The schematic for the chipamp is shown below in Figure 01 and consists of just three resistors. 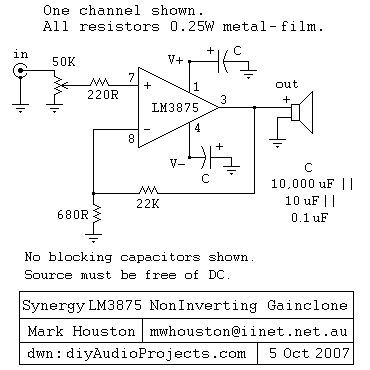 This is very similar to the many gainclone amplifiers that have been constructed by DIYers. The layout follows my veroboard point-to-point LM3875 gainclone chip amp and goes one step further by eliminating the tiny veroboard. Now the chassis and active components work in Synergy. Pure silver wire is used for the input signal and heavy duty copper wire is used from the chip output to the speaker binding posts. Silver solder is used throughout. A schematic of the power supply is shown in Figure 02 below. An RFI filter is used to clean the mains power. A 50VAC center tapped toroidal transformer rated at 160VA and an 8A rectifier bridge are used to supply about +/-35VDC. 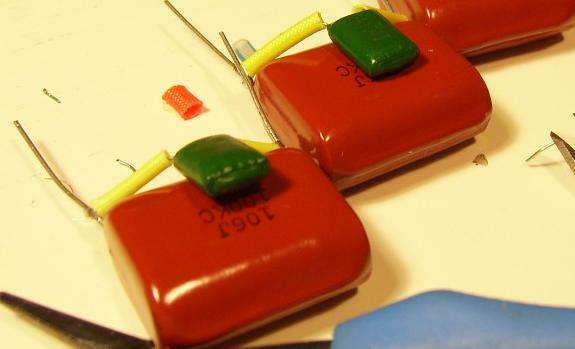 The huge red tanks you see are inexpensive electrolytic capacitors rated at 10,000 uF / 100V. 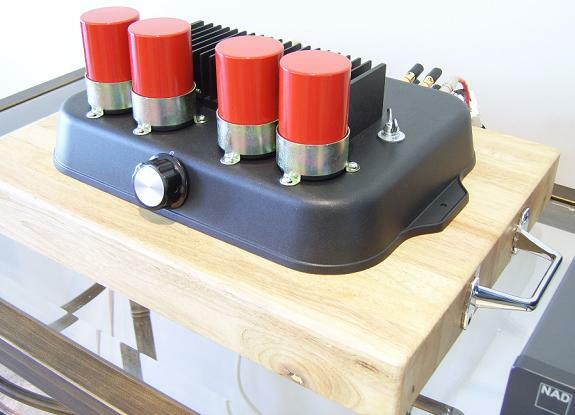 The plastic label has been removed from the capacitors and the metal case primed with an acid etch primer and then sprayed with multiple light coats of red to produce a professional and tough finish. The power caps are insulated from the mounting brackets with electrical tape. Oxygen free copper cable is used for the power supply wiring. 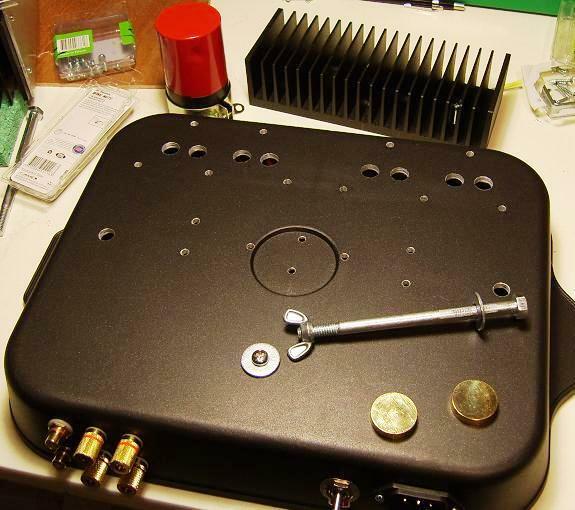 I'm a huge believer in snubbing which I bring forward from my valves amp projects. 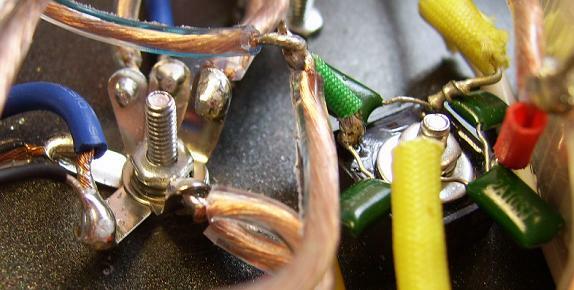 The rectifier bridge is snubbed with 0.01 uF polyester caps to reduce diode switching noise. The line caps are snubbed with 10 uF polypropylene and 0.1uF polyester capacitors. The 10 uF caps help mid-range frequencies pass cleanly through the power caps and the 0.1 uF caps remove noise in the caps generated by parasitic inductance and resistance. A star ground configuration connects all ground points to the chassis. 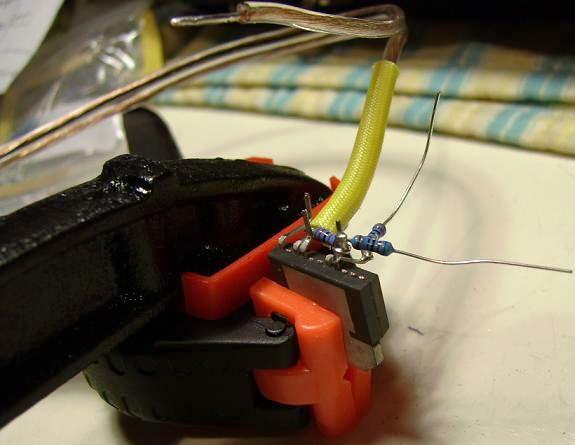 The mains ground to the chassis is through two loops around loops ferrite core to reduce potential hum and RFI. There is absolutely no hum, buzz, hiss, crackle or anything coming from the speakers when the amp is on. You read where the subjective reviewer tells of the equipment vanishing and revealing the music unfettered. Well for the first time with any of mine or anyone else's gear that this is what I hear. There are no speakers there is just the music. A soundstage projecting from the wall behind and from the sides fills the room (7 x 8 x 2.5 m) with clear detail and multilayer texture and complex timbres. The setup consists of a NAD C542 CD Player, DIY Cotton ConneX interconnects (similar to the DIY Silver Interconnect Cables but with cotton insulation), the Synergy LM3875 amp and small two-way bookshelf speakers. Speaker cables are twin runs of oxygen free copper cable. I expect the amp to improve over the next weeks but for now I am stunned! For an update on this project, see Mark's second build of the Synergy gainclone in the LM3875 - not a better mouse trap just better built thread.